The Forbidden Gospels: How can we know anything from our texts? I am glad to see this discussion on the historical validity of Acts. I am working toward a dissertation in Acts and cannot simply dismiss that there is some historical value in Luke's narrative. Granted, my minor is theological hermeneutics so i am constantly asking, "how do we know anything is of historical value?" This is THE question, isn't it? It is a question that we must keep before us every minute as we work through our texts. Skepticism must be second nature. But a working skepticism doesn't mean that we ditch the text as unable to yield any historical information. For me it means that we start with the assumption that the text is not directly relating history - that is, as it is written, it is not telling us how history actually happened. It is a narrative of memory and theology. As skeptics, we begin from the position that the narrative must prove its history to us. So the real quest is the one of historical hermeneutics, trying to recover elements that are older than the narrative itself, elements that might point us to an earlier time - to an earlier history and an earlier theology. Since communal memory functions to continually update the older traditions to keep them fresh and relevant, we can recover older memories and perhaps even sources by observing how the present author reworks the materials to his liking. Whatever he is reworking, is received tradition that he wishes to revise. This I call for lack of a better term, identification of authorial revision of received tradition. So this is my first step in historical reading. My second step is reading against the grain, trying to read the narrative against its intended purpose, to see if this reveals anything of merit. Part of this process is identifying anything in the narrative that doesn't support the agenda of the author, anything that conflicts with the narrative's flow or the author's stated theology, anything that doesn't fit the author's contemporary story. Third, I try to identify the bigger story that the author assumes its audience knows but which we might not know. Other contemporary texts help here because they may contain elements of this bigger picture. Mainly, it amounts to sitting down and mapping the elements in the narrative that are introduced but never explained. Then trying to understand these elements based on our knowledge of other texts from antiquity. Fourth, I use other contemporary texts as points of comparison. In the case of Acts, we are so lucky to have Paul's letters (and James - yes, I think that James is an early letter from the Jerusalem church). These letters give us comparison points to evaluate what is going on in Acts. I presume you mean skepticism with regard to all texts including 'Paul's' letters, which I (in my skepticism) believe were originally written by James, and James' epistle which may be written from Jerusalem, but which I (again in my skepticism) believe was written from Rome. So when you evaluate what is going on in Acts using 'Paul's' and James' letters you are at the same time evaluating those letters. There are no standards to work from. I think given the Flavian historians of the period, there are excellent grounds for skepticism, according to Brian W. Jones. I think your steps to reading texts are quite helpful. I would add to them something that I try to do when I read. I like to think about what is at stake if the outcome turns out one way or the other. Sometimes this really sheds light on what an author is trying to do. It also makes some things more opaque but others a lot more clear. I agree that what you have described is the task of the historian. But, as someone mentioned in response to an earlier post, the Christian community, while trying to relate the Biblical material to history as much as we can, also uses the Bible in different ways too, such as devotional, teaching and as a series of documents that have authority for the life of the Church and the Christian individual. What I really appreciate about what you've said in earlier posts is that the material should be considered within the context of 1st century Judaism. The shift to contemporary hermeneutic is really another task altogether. To have it grounded in the historical, I think lends the shift more credibility. But this is not easy to do. Sometimes I think being a plain ol' historian of antiquity is easier than the hermeneutic that you are after to make the text meaningful to a contemporary audience of faith. Here is a little test of one's skepticism. What do you think fastened itself to the hand of the missionary in Acts 28.3? I think you are correct. I find Lindbeck, Frei, Childs and their followers helpful in the later pursuit. (b)The autobiographical writer (James) of Acts remembered what he said HIMSELF while he was in Jerusalem: “My brothers, although I have done nothing against our people or against THE ROMANS, I was arrested in ROME and handed over to the SENATE. They examined ME and RELEASED ME, because I was not guilty of any crime deserving death." And James was executed shortly after. For skeptics, Acts is a book of reversals. Which is it to be (a) or (b)? Place your bets folks. I, too, welcome discussion about the accuracy of Acts. It baffles me why so many feel justified in dismissing the reliability of Acts with a wave of the hand. Too often we hear the "Acts is a secondary source" mantra. The supposed unreliability of Acts is so often assumed, but rarely is evidence given. Colin Hemer perceptively wrote that the question of the historicity of Acts "has been strangely neglected" and that "many writers seem simply to assume that the question has been answered, one way or the other. Some even contend that the question is illegitimate, although again there is an answer implicit in such a contention." However I am not sure, April, that there is a trend towards a sceptical view of the reliability of Acts, though admittedly there are still some followers of the chronology of Knox, for example. What is reliable about extant Acts is its fairly consistent reversal of places, characters and journeys, particularly in the second half. The journey by ship supposedly taking Paul to Rome with prevailing north westerly winter winds would have been a doddle. The ship was in fact taking James to Caesarea, travelling from Alexandria with grain for certain priests that were being starved by the high priests stealing their tithes. This was an attempt by a prophet to help starving priests with the backing of the Roman government. The ship had to take shelter, more than likely in Paphos, Cyprus. Personally, I don't think there is any alternative to evaluating each individual detail on its own merits. How much of Luke's information would have to be accurate for him to be considered a 'reliable historian', for example? 95%? 51%? I'm not sure that such generalizations are helpful, especially as they give a misleading impression to people today who don't have the background to understand that Luke may have been reliable by ancient standards, and yet it may still be true that none of the words he attributes to Paul are things he knew Paul to have said, as opposed to being the sorts of things Paul was known to have said. The ancients and moderns are easily hoodwinked by the 'beloved Dr Luke'. The one thing that may be missing is the connection between the text and the historical period. I think this is important because this is where the rubber of historical reliability hits the road. We can discuss source-criticism and our historical hermeneutics all we like, but, in the end of the day, if our concern is historical reliability, checking it insofar as it is possible against what we know of the period and places may help tell us something about the source. Sure, this can be faked, but big mistakes should cause us pause. In the case of Acts, a lot of the background and atmospheric details are consistent to what we know. The mention of the cult of Artemis in Ephesus, the mention of the Areopagus in Athens and such things were common knowledge, so may not signify much. The connection to historical figures whose existence we can verify such as Philip (Herod's son) and Felix (the governor of Greece) has been checked and suggests that either the events have historical connections or someone faking it is doing a good job. The problem with Early Christian texts, of course, is that there are precious few people who would have been regarded as important enough to feature in mainline Roman or Greek historiography until after Constantine. So, parallels and connections are few and far between. Still, these can help us with the reliability question to some degree. Phil, they were more than likely eliminated from the text, or they were given different names with a distorted history - Flavian editors again. In the case of Acts, I am thinking of names like: Claudius, Agrippina, Seneca, Burrhus and Nero. I would not be surprised if the name of Josephus was not in the original text along with James. In the writings attributed to Josephus, the text about Izates and Helena was almost certainly originally about Nero and Agrippina. I have convinced myself that before it was ‘rearranged’, Acts 4.36 and 5.1-11 was a very real historical story of some notoriety in Rome. It was the historical source used by the editor of Matthew to create the myth about Judas’ bribe money being used to buy a field as a burial place for foreigners - note. (Mat.27.7). The text is a perfect example of the reversal technique used throughout Acts by its editor. I can’t help thinking that in Acts 4.36, the phrase ‘a Levite from Cyprus’ with reference to ‘Joseph’ is the interpolated banal fabrication of an editor. I suspect that ‘Joseph’ was well known to the writer and to the person for whom the text of original Acts was written and that there was no need to say who 'Joseph' was. ‘Joseph’ sold a field and gave the proceeds of the sale to the ‘Christians, according to 4.37. Ananias, the same name as an infamous high priest, apparently also sold some land (5.1,3), but didn’t give all the proceeds to the ‘Christians’. My sceptical mind asks, “Did Ananias buy the land that ‘Joseph’ sold, and kept it for himself instead of using it for some charitable purpose that might help the ‘Christians’? Has the text of Acts 5.1-10 been reversed from an original purchase of land by Ananias to an extant sale of land. ‘Didn’t it belong to you before it was sold?’ (5.4) with reference to the money received from the apparent sale, is a stupid question to ask, since obviously Ananias did not possess the money from the sale until the land was sold. I therefore suggest that something deeper was at stake, and that land was in fact purchased, but with money that did not belong to the purchaser, but to God. In other words this was sacred money from the temple and that the purchaser was none other than Ananias the high priest who at one time was the temple treasurer. If Ananias had sold land, kept some of the money for himself, and given the rest to the ‘Christians’, then it would NOT have been apparent that he had kept any money back unless the unknown buyer revealed the purchase price. The buyer is not on the scene. So how would the ‘Christians’ have known what Ananias got for the land, and that he was lying? Ananias could have lied through his teeth and got away with it. So could his wife Sapphira who was in on the deal. So did ‘Joseph’ sell his land to Ananias somewhat cheaper than normal commercial rates in the belief that Ananias would donate the land for a charitable purpose? And did Ananias see this as a shrewd opportunity to acquire land cheaply and build a prestige house for himself and his wife, and large family – the high priest Ananias had seven sons, and probably daughters too? If Ananias bought the land with sacred money, then the original text of 5.4 would have been 'Didn’t it (the money) belong to God before it was bought?’ This would not have been a stupid question. Also if Ananias did not use the land for its intended charitable purpose, this would have been obvious to the ‘Christians’ fairly soon after its purchase. If Acts was originally autobiography, then why not look for sentences that could have been in the first person? Take Acts 1.15 for example. One might have expected that the natural leader would have stood up to address the group. This leader could have been the original writer of Acts, particularly if he was the one later chosen. Thus he would have written: ’I stood up among the brothers.’ (brothers implying Jewish brothers is explicit in 1.16). Then there is the concluding sentence related to the person chosen to succeed Judas in 1.26: ‘So he was added to the eleven apostles’. This could have been simply: ’So I was chosen’, that is the writer was chosen in response to his statement ‘It is necessary to choose ONE of the men who has been with us the whole time’. The choice could still have been a majority vote by secret lots. 1.22-26 about making a choice by lots between a Joseph a and a Matthias looks like an editor’s fabrication. If the natural leader who stood up in the first place was chosen to replace Judas, then was Judas the original leader of the earliest ‘Christians’?. 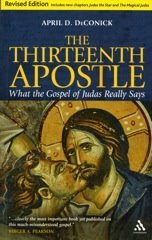 I suggest that 1.16 was originally about the Spirit (explicit) speaking through the mouth of Judas (not the editor’s 'David') who served as a leader (not the editor’s 'guide for those that arrested Jesus'). That the editor thought this was a leadership issue is reflected in his quotation of Psalm 109.8. The ‘Christians’ were looking for a prophet successor to Judas. It had to be someone through whom they believed the Spirit could speak to them. Is Luke a trustworthy historian? What was going on in Antioch? Now Jesus is not Jewish? SBL not an important venue for critique?